Jewish Lights Publishing, 9781580231770, 32pp. A lesson in hope and faith--and learning that there are some things in life beyond our control--for every child who has worried about what comes next. Adam and Eve's very first day in the Garden of Eden was perfect--safe and unshadowed by worry, doubt, or fear. God's first two people saw morning lift the sun high in the bright sky, and they rested in the contented warmth of the peaceful afternoon. Before long, Adam and Eve realized that the sun was slipping away. First it began to sink beneath the clouds, to fall behind the mountains, and then the sky became dark, the air cold. 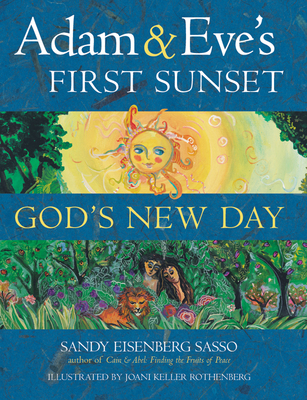 This engaging new story from award-winning author Sandy Eisenberg Sasso explores fear and hope, faith and gratitude in ways that will delight kids and adults--inspiring us to bless each of God's new days and nights.